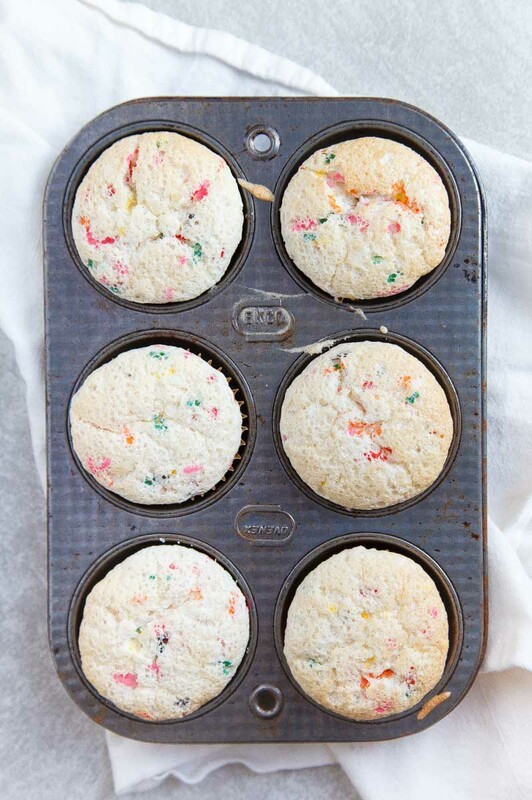 Funfetti cupcake recipe that makes 6 cupcakes, made from scratch! 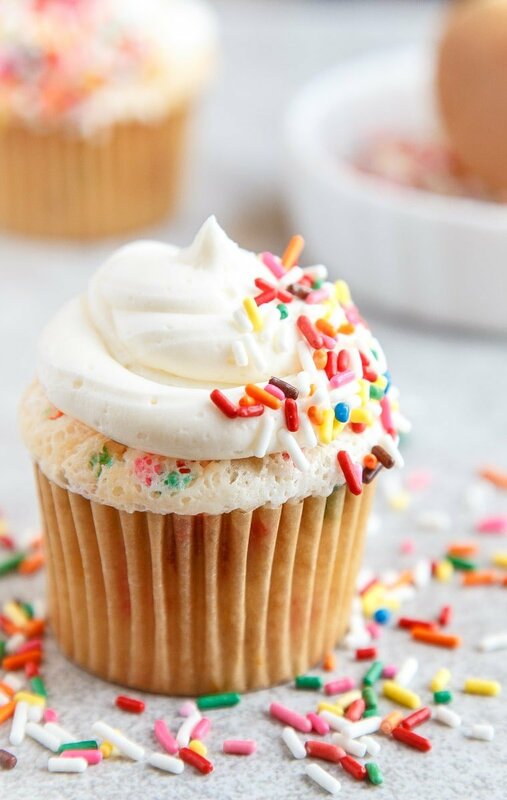 Homemade funfetti cupcakes are perfect for a half birthday cake or a kids birthday cupcake celebration! Can we get happy all up in here today? Seriously. I know it’s Monday, but there are great things happening in the world! A healthy babe is the greatest thing you could ever ask for in life, and I am just filled with so much joy these day because of it! I’m not going to lie–I have seen friends go through tragic things with their kids this past year. Those kinds of things don’t really hit you the same way they did before you have kids, ya know? So, I’ve realized lately how special, wonderful, and magical it is to have healthy babes! And nothing says gratitude like sprinkles? 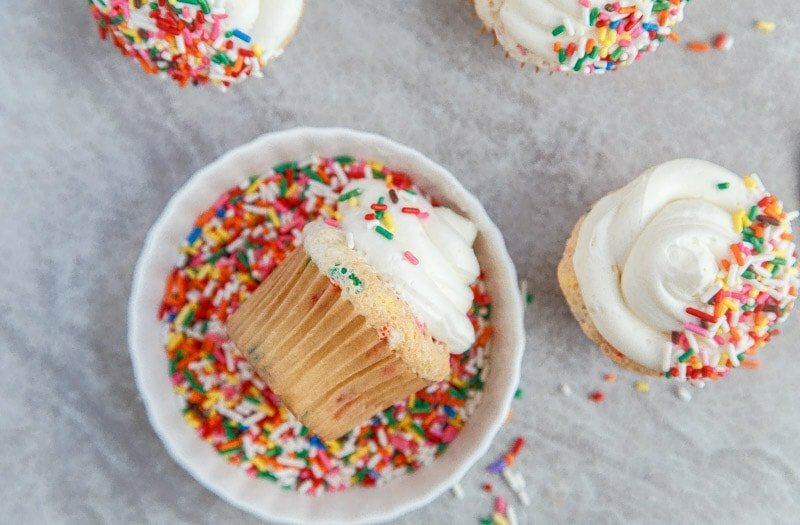 I created this funfetti cupcake recipe that makes 6 cupcakes so that we can work a little more sprinkles into our everyday lives. A small batch of cupcakes makes everyone happy, doesn’t it? This is the first funfetti recipe on this site. Shocker, I know. It’s just that, I always thought funfetti had to made with the cake mix and canned frosting, and those two things are not allowed in my house. But, tons of butter and sugar that I make at home? No problem! Update: I actually made a mini funfetti cake in a 6 inch cake pan recently, and I love it! For date nights, I created these funfetti cakes from scratch in ramekins. I love making small cakes for two in ramekins to enjoy as a romantic dessert. I should mention these are actually funfetti ANGEL FOOD cupcakes. I wanted light and fluffy cupcakes punctuated with sprinkles, so I made a small batch of angel food cake batter. I was hoping this recipe would make a dent in my sprinkles collection, but it hasn’t. That just means I have to triple it and make more, right? Who’s coming over to help me get happy and eat pretty cupcakes? Preheat the oven to 350, and place 6 paper liners in a cupcake pan. In a medium-sized bowl, sift together the flour, cornstarch and salt. Sift it back into another bowl, and repeat one more time for a total of 3 siftings. In a separate bowl, beat the egg whites with an electric mixer on high until foamy (about 30 seconds). Once foamy, add the cream of tartar and beat until soft peaks form (about 2 minutes). Next, slowly stream the sugar, 1 tablespoon at a time, into the egg whites while beating. Beat in the vanilla extract. Finally, gently fold in the flour mixture to the egg white and sugar mixture using a rubber spatula. Proper folding technique is down the middle and sweep the sides of the bowl. Don't deflate the batter by stirring too vigorously! 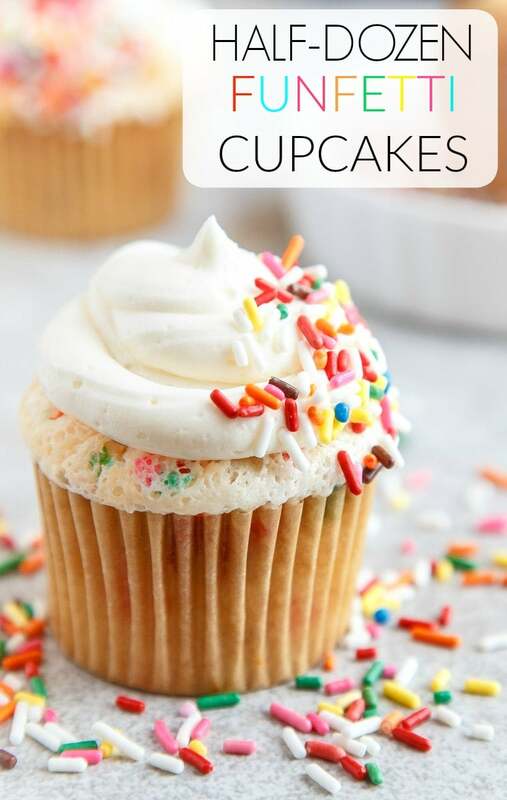 Divide the batter amount the cupcake liners and bake for 17-19 minutes, until the tops of the cupcakes are starting to lightly brown and a toothpick inserted comes out clean. Let the cupcakes cool near the oven. They will shrink, but they will still have flat or slightly domed tops (angel food shrinks when cooling). Once the cupcakes are cool, beat together all of the frosting ingredients, using milk to thin it as needed. 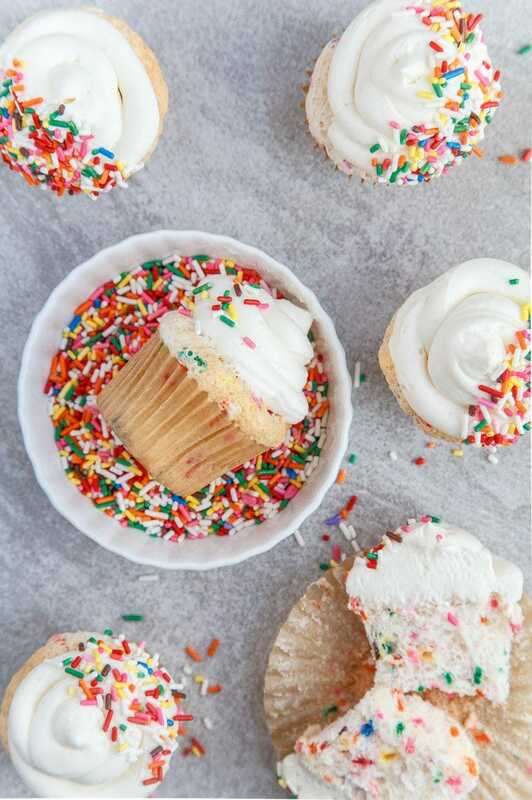 Frost the cupcakes with the frosting, decorate with more sprinkles, and enjoy! These cupcakes look like the perfect way to celebrate! oh yummy! I’ll help you eat these cupcakes! Six cupcakes is the absolute PERFECT amount. I always end up having to use part of the batter and freeze the rest. Then I forget about it and eventually toss it. Love LOVE this! This looks similar to the angel cake cupcakes in your cookbook. I made them 3 times and all 3 times they fell :( What am I doing wrong? I tried dividing a similar recipe (it just used superfine sugar and cake flour instead of AP flour and corn starch and sugar) and that worked fine. My batter made five very tiny cupcakes not six. Also, I made the mistake of trying to touch a piece of the top of a cupcake that had bubbled up when I pulled them out of the oven, and since its angel food, it stuck like glue to my fingers and burnt them. The angel food cake was good, I guess I will have to try again. I don’t see how six full sized cupcakes come from that batter though. Oh My! Babies! Reason to bake cupcakes those little rays of sunshine for sure! Our 4 grandkiddos would go nuts over these beauties! And they are the lights of our life! Definitely A good excuse to pull out the sprinkles and celebrate them today! I never know who might run thu that door and delight us next! Thanks for spreading some cheer. I can not think of anything more perfect than these! Have a few small birthday celebrations next month that these would be perfect for. I swear funfetti makes everything better! I wish I had one of these cupcakes now – they look so moist, fluffy and delicious. Perfect for when a single serving is in order. KIDDING! Sort of. ;-) I love the rainbows! Oh how I love small batch desserts! I lack any form of self control when sugar is involved! :) These look great! These look amazing! I love angel food cake, and have never though to make them cupcakes! aw YAY FOR ALL THE BABIES!!! 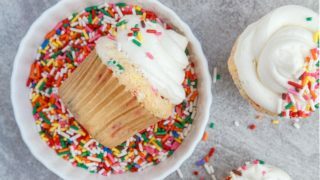 These funfetti cupcakes are amazing-I love how light they look (angel food cake is one of my faaaves) and so happy and FUN! :P pinning! Are these 6 regular size or muffin size cupcakes? Hi! This made 18 cupcakes for me! But! The sprinkles melted into the batter in the oven. Is there any trick to this, or am I supposed to get a specific type of sprinkles? I’m a bit confused as to how 6 cupcakes were split into 18 cups…it makes me think that there wasn’t enough batter in each cup, so they got really hot and melted the sprinkles? Love confetti. Love Angel food cake. So it’s a win win. These came out great! I just wanted to add a comment because the few comments above saying that they couldn’t get the recipe to work for them almost turned me away, but I decided to try it out and they came out just as described. Fluffy and light! I had a bit more batter (possibly because I used extra large egg whites?) and ended up with 9 cupcakes. I’m so glad to know that extra large egg whites work here, and therefore yield even more cupcakes–HOORAY! Thanks, Nina! I made these last night and must have overwhipped the egg whites or something because I somehow managed to get 12 cupcakes out of it. They turned out a little deflated, but other than that, they were just fine. I think I’ll use the extras for strawberry shortcake parfaits tonight. The only question is, what on earth am I supposed to do with the 3 leftover egg yolks? Hi Christina, I am so glad I found your funfetti cupcakes. I am about to make them for my friend’s daughter’s birthday. Can you please tell me if I can double this recipe to yield 12 cupcakes? Thank you so much for your amazing blog. I think so :) I haven’t tried it though! PS you’re not at high altitude, right? Thank you so much for your prompt reply, it really helped. I actually made two batches of the exact recipe you listed to get my 12 cup cakes. I didn’t want any last minute sad faces. Thanks again. Keep rocking.